Award winning singer songwriter and ukulele player, Mandy Harvey is joining Jay in a special one-on-one interview to discuss her successful journey as a deaf musician. Mandy Harvey is a deaf American jazz singer and songwriter. In 2011, Mandy won VSA’s Top Young Soloist Award. As a successful performer touring thought the U.S. in 2017, she became a household name after winning the 4th place on America’s Got Talent. In addition, Harvey is an Ambassador of the nonprofit organization No Barriers where she inspires and assists others to break through their personal barriers. Jay Ruderman: Singer songwriter Mandy Harvey lost her hearing at 18 and since then she’s gone on to become a successful musician. Today, she joins us for a special interview. Announcer: All Inclusive, a podcast on inclusion, innovation and social justice, with Jay Ruderman. Jay Ruderman: Welcome to All Inclusive, a podcast on inclusion, innovation and social justice. I’m Jay Ruderman your host. 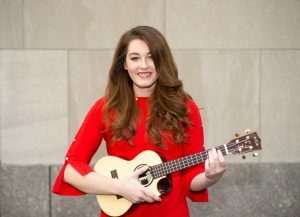 An award winning singer songwriter and ukulele player, Mandy Harvey has released three jazz albums, receives the VSA’s 2011 international young soloist award, and was a finalist on the 12th season of America’s Got Talent. We’re proud to have her with us here today to discuss her journey as a successful deaf musician. Jay Ruderman: Mandy, thank you for joining us. Mandy Harvey: Thank you for having me, I’m really happy to be here. Jay Ruderman: So, let’s talk about how and when your musical journey began. Mandy Harvey: I started as part of choir. My mom put me in a choir class, pretty sure for daycare needs. And I fell in love with it. I was always a hard of hearing child, so for me it was a way to be a part of a community and a part of the conversation and it kind of became addictive as my form of expressing myself. Jay Ruderman: It’s my understanding that your path was already set and then at age 18 you completely lost your hearing while majoring in vocal music education at Colorado State University. Can you tell us your story? Mandy Harvey: I went to school for education, I never in my wildest dreams wanted to be a performer. But I wanted to give other people the opportunity to express themselves and to be able to be a part of that community factor that I fell in love with and so I went to school for vocal music education and I was just happy. My dream and my reality met beautifully and after a months of being at Colorado State University, I started to have extreme difficulty understanding anybody and I couldn’t understand my teachers talking anymore. And over a course of nine months I went from being slightly hard of hearing to being profoundly deaf, 110 decibels down in both ears. Mandy Harvey: And later we found out it’s because I have Ehlers-Danlos syndrome, or EDS, and my nerves were deteriorating, and that was the cause of my hearing loss but at the moment I was just a music major watching her dreams and her future being ripped out of her hands and I had no ambition or no understanding that I would ever come back to music. I thought that once you lost your hearing that was the end. But I was extraordinarily wrong. And I’ve been influenced by so many amazing deaf musicians. Jay Ruderman: So I should tell our audience that we’re conducting this interview with a sign language interpreter who’s interpreting what I’m saying to you and then you’re telling your story but you sound as if you are a hearing person, your language sounds perfectly clear. Do you receive any criticism from people in the deaf community who may have maybe deaf from birth? And just tell me how you fit into that community. Mandy Harvey: I think it’s a little difficult. I work on speech therapy and have been ever since I was a child because I was hard of hearing and speaking clearly in this manner is not easy for me at all. It’s very laborious, and when I’m tired I have a very thick deaf accent that comes out. But I think everybody struggles with feeling like they belong. Mandy Harvey: When I first lost my hearing obviously there’s people who were born deaf and have a very deep rooted community system in place and I felt as if I really didn’t belong in either world, you know, the deaf word or the hearing world. I was in kind of limbo as I had lived 18 years mostly in the hearing world and now I was being transitioning in. Mandy Harvey: But I have to tell you, as soon as I moved back home from school, I started taking sign language classes and it has become a huge door opening for communication for me and getting involved with the deaf community and having friends who understand just the barriers that you face on a daily basis has been instrumental to me with accepting my life the way that it is now instead of trying to chase a life that I just don’t have anymore. Mandy Harvey: And of course you’re gonna get people who are critical of anything that you do, but you can’t allow other people to dictate your actions. As an adult, I care less about appeasing every single person and instead try to make communication as easy as possible, try to express myself as much as possible and try to encourage as many people as possible. Jay Ruderman: It sounds like a very strong positive attitude that you’ve spent a lot of time developing, so I commend you for that. Let me take you back to when you lost your hearing and I know that initially you left school and decided to give up on music. Can you talk about that period in your life? Mandy Harvey: Well you know, I had fed into all of the voices that were around me which were saying that if you can’t hear you can’t do music and I allowed them to convince me that that was true and so I gave up on music I didn’t even sing in the shower for a year and a half. And it was as if a part of my soul died because music has always been so connected with who I am and so I kind of call that my zombie period of time, I just got up, I did small things, I went to sleep, I got up, I did small things, I went to sleep. Jay Ruderman: What made you get back to music? Mandy Harvey: Eventually my dad encouraged me to pick up the guitar again and play with him because we had been playing guitar my whole childhood together. And so I was watching the chord patterns and watching the strumming and I was playing the chords with him and in rhythm with him as I was watching and I was feeling the vibrations from the instrument on my fingers and down my arm and against my stomach and my chest as I was holding onto this guitar. Mandy Harvey: And from there I was encouraged to do something even more ridiculous which was try to learn a song to sing and the process of using visual tuners and feeling I’m putting my hand on my throat finding where the vibration was the strongest for each note and marking it off on my throat, doing an inordinate amount of scales and running through patterns again and again and again and again and every time making a mistake, starting the entire process over. Mandy Harvey:Even though I’m sure it sounds nothing the way that it used to be, it’s me. And I’ve found an incredible freedom with singing without being able to hear myself, I can’t judge myself. And I’m not scared to sing anymore. Once I could figure out how to get a song out, I was encouraged by other people to perform at a jazz club just an open mic night in Fort Collins, and that was my old vocal coach. And you know, that started from a simple conversation. She said hey, what do you want to sing? And now that I can pick, I said well I want to sing jazz. Mandy Harvey: And so she’s like great, sing a song in front of a live audience. And you know, I’m a very shy person, I’ve never wanted to be a performer, and this was way outside my comfort zone. But I said yes, I’m committed to it. And so I showed up, I sang in front of seven people, most terrifying performance I ever did in my life, one song. And then from there they asked me to come back and then I did it again, and again and pretty soon I was touring and pretty soon I was making albums, all because other people kept asking me to do it. Not because it was my idea. Mandy Harvey: I kind of got pushed down a stream, and it led me all the way to doing something ridiculous like America’s Got Talent. Jay Ruderman: Tell us more about your life touring as a musician, and specifically let’s talk about America’s Got Talent. What was it like for someone who’s shy, to be on such a major stage. Mandy Harvey: Touring was a big change for me and I really wanted to motivate and encourage other people that was always the driving force behind touring. It wasn’t self-glorification or getting any kind of acknowledgement for what I was doing. I just wanted to say that it’s okay to fail, and to brush your knees off and stand back up and try again. Mandy Harvey: But I just wanted to make people smile and so when people were like, well can you come sing here? I was like sure. And then soon it was not just me and a pianist and it was me and a full band and you build and you grow and people keep asking you to come back. And then I was offered an opportunity to audition for America’s Got Talent. Mandy Harvey: For a very long time I said no. And that was because I was too afraid to do it. But I was talking to those people who are closest to me, and they asked me a very simple question. What do you want to do with your life? I want to encourage people. I want to say that it’s okay to fail, that you can get back up. I want to make people smile, I want to show a different side of what a disability looks like and say that there’s a bunch of invisible ones. I want to say that we can lift and encourage people instead of pushing them down. That’s what I want to do with my life. Mandy Harvey: And they said well why not do it on a big scale? And I was like, because it’s terrifying! But you know, what I wanted to do and encourage people was so much more important than my fear. So I showed up. Mandy Harvey: I had not seen the show before, I didn’t know what a golden buzzer was. I assumed I would get axed off. And when the golden confetti came down and Simon Cowell was like you’re not gonna need a translator for this, no way in my wildest dreams would I have imagined that happening. And then from that to go onto being seen collectively over five hundred million times just that audition video is bizarre. It’s … That’s not real to me. But you can see millions of conversations of people encouraging each other, and no matter what happens it was the best decision I could have made just to start those conversations. Jay Ruderman: Well it was an awesome performance and for anyone who hasn’t seen it, I would definitely encourage them to check it out. Let me just ask you about something that I’ve been thinking about a lot and has actually been in the news, that many artists have come out very vocally and talked about mental health. And challenges that they have in the industry, can you talk about the mental health challenges that you see in the industry and the benefits of people who are public figures speaking openly about their mental health challenges? Mandy Harvey: There is a lot of frustration, there’s a lot of hopelessness, there’s a lot of depression, there’s a lot of anxiety that is rampant right now. And it’s not just the performers, it’s everyone. But now you’re in a public situation where you’re always supposed to be smiling and you’re always supposed to be giving of your time and I mean, I’m home maybe a few days a month. And so to never be able to be home, to sleep in my own bed, and to just be able to relax and recharge my brain, it just doesn’t happen as much as it should. Mandy Harvey: And so I think that there’s just so much pressure for people with any job to do their best and I think that it’s great that we’re talking about it. Mental health is something that we don’t put a lot of effort into, and we don’t talk about as much. And it needs to be expressed more. Jay Ruderman: Thank you. When I last saw you perform, which was at the Ruderman Inclusion Summit in Boston, you perform without shoes. Can you just talk about why you do that? Mandy Harvey: I’ve started really developing feeling the floor through my feet. When it’s just me and a ukulele, I could probably wear shoes if I wanted to because I’m holding the instrument against my skin. But it’s so I can feel different things through the floor. It’s a lot of work, but I’m happy to do the work. Jay Ruderman: You’ve been accused of promoting oralism. And as a result you received death threats from within the deaf community, for what they describe as promoting hearing activity. First of all what is oralism? And can you describe what this is all about. Mandy Harvey: I can give you my take of it. You know, the deaf community has been so oppressed for such a long time. And it hasn’t been until recently that we’ve even acknowledged that sign language is a language. In fact, I’m pretty sure only 44 states even accept it as a foreign language, which is ridiculous. But, to have a language, to be proud of your culture, it’s survival. And it’s important. Mandy Harvey: So there’s part of it that I very much understand, you know. You’re trying to break kind of a culture norm. But, there’s so many different forms of being deaf. You know, being deaf doesn’t mean that you can’t speak, being deaf doesn’t mean that you don’t like music. Being deaf doesn’t mean that you have to live in one small bubble. And so I think in my situation with oralism which is saying that I talk, and I sing, and so I’m doing hearing activities and in some perspectives it would be as if I am shunning the deaf community and saying that they’re broken and need to be fixed and I want to live in the hearing world. Mandy Harvey: In my situation, it’s a very small group of loud voices that are critical. And the general population of most the deaf people that I’ve met love what I’m doing, because there’s a huge culture shift that’s been going on in the last 15 years called Deaf Can. And it’s saying that deaf can do anything that they want to do, they can do any job. They can do any activity, they can sing, they can paint, they can climb mountains, they can have kids, they can be teachers, they can be CEOs of major companies. It doesn’t matter. Mandy Harvey: And so this movement is taking over and those voices who are staunch we have to keep things exactly the same or else our culture will not be the same, it’s starting to fade a bit. You can’t stop change. And you can’t stop growth. Jay Ruderman: So you’re very involved in social media. And how do you deal with people who are overly critical, trolling you on social media? What’s your technique for dealing with that? Mandy Harvey: Ignore them. People are gonna be so critical about everything, you know. I have people who tear me down because my eyelids are kind of swollen looking. I have EDS, it’s one of the problems with having it is (that) my skin is overly hypermobile, and stretches and so the skin swells and it’s movable. And so I’ve had people who criticize my face, I have people who criticize my legs and the fact that they’re swollen all the time. I don’t care. And I am trying to encourage and lift up as many people as possible. And I know that I’m not gonna make everybody happy. Mandy Harvey: And people if they want to have an honest conversation with me? Happy to have a conversation. If they’re just going to say hey, you’re a fat slob. Delete. You know? Ignore them. It’s an anonymous thing to get a rise, to get a reaction so that maybe they are seen. And maybe that’s their own pain that’s being leaked out. Jay Ruderman: Very wise. So today you are an ambassador for a non-profit organization called No Barriers that helps people with disabilities overcome obstacles. Can you tell us about your role and work at No Barriers? Mandy Harvey:Their goal is to help people with and without disabilities or different abilities to overcome those obstacles. And so you have beautiful and amazing people who have founded this organization, one of which is Erik Weihenmayer. He’s the first blind man to climb Mount Everest, and has since done the seven summits and kayaked the Grand Canyon and he is a co-founder of this group and their motto is what’s within you is stronger than what’s in your way. And it’s really just a community of people who acknowledge that barriers exist, smack into those walls on a daily basis, and say hey, let’s cheer each other on, let’s find solutions, sometimes creative technology solutions, to be able to accomplish our goals and our dreams as a team. Mandy Harvey: I’ve seen some amazing people in this group. Kyle Maynard was born without arms or legs and he crab walked up Mount Kilimanjaro. And I think he’s done three of the seven summits now. And he worked with a group of people to design technology of his own special shoes and that gets them up ice. It’s incredible how much can be changed if people work together. Mandy Harvey: And so my role in it as an ambassador is just mostly to encourage people. Which is an amazing job. I get to encourage people, I get to help improve certain aspects of inclusivity and make sure that things are a little bit more inclusive and smooth and that technology is being used where it should be used and interpreters are being provided and show up and volunteer my time and go do outreaches and hang out with kids. It’s a beautiful part of my life. Jay Ruderman: Thank you for your leadership there. I just wanted to end with talking about your new book. You’re the co-author of a book called Sensing the Rhythm, Finding My Voice in a world without sound. What will people learn from your book? Mandy Harvey: This book is a collection of life lesson that I have painfully learned and they’re all connected with stories about my life. I have been through a trauma, and my life has changed dramatically. And I dealt with depression, and I’ve dealt with barriers and walls and you know, finding out about things that I can’t control and surgeries and so my goal for the book was to just be very honest. These are the things that are happening. These are the things that I’m choosing to learn from and how it’s made me stronger. Mandy Harvey: And to be an encouragement to other people who are going through their own journeys and who are struggling on their own sides, or who just want to, you know, read something a little bit encouraging for the day. Jay Ruderman: Well thank you Mandy Harvey. You are a beautiful soul and a beautiful person and I look forward to hearing more of your music and your story and I want to thank you for joining us today. This was really great. Mandy Harvey: It’s beautiful to know that you guys are working so hard to help make the world a much better more inclusive place and the efforts that you guys are doing are just astronomical and they’re amazing, so thank you I’m honored to have been able to chat with you today.